Blog Home > Automation > What is Dynamic Zone Allocation, and why do You Need it? 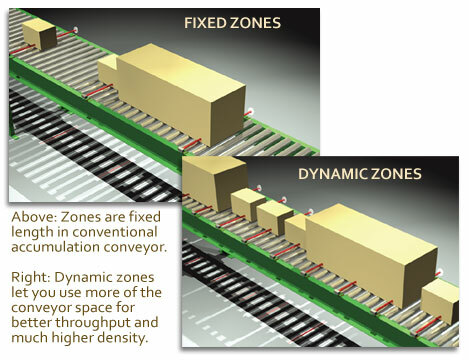 A recent development in conveyor technology is dynamic zone allocation. Zero and minimum pressure accumulation systems have been around for years, but suffered from variable loads. If you have zones of, say, 24″ and some cartons that are 15″, the smaller cartons have to take up space as if they were the longest load on the system. An animation depicting DZA can be found here. This results in what amounts to wasted space on the line and slower throughput since the conveyor can handle fewer items simultaneously. Dynamic zone allocation automatically adjusts the conveyor’s zone length to accommodate the length of the carton being conveyed. Longer cartons are easily and efficiently conveyed in singulation mode, giving you better control of conveyed boxes. Carton throughput is increased, as well as accumulation density and system flexibility. This naturally makes your conveyor system more flexible and more efficient. You can size your zones for the smallest carton in the system and still deal with the largest one. What’s more, longer cartons can be introduced after installation and don’t obsolete your conveyor investment. Dynamic zone allocation is part of Hytrol’s EZLogic Gen 3. If you need the kind of product density and conveying flexibility it offers, it’s a worthwhile option.